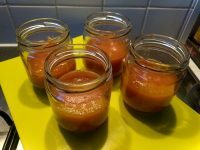 I like making compote with all sort of fruits as it is easy to eat and full of flavours, for this recipe, I decided to add to the basic apples and pears, some plums. On top of that, it is easy to make a medium batch and store it in glass jar for a couple of days in the fridge. 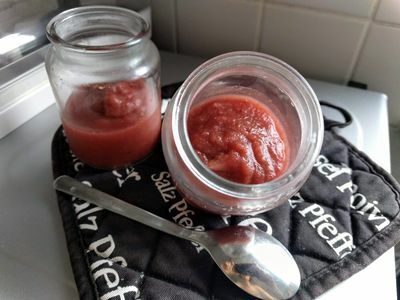 The compote can be eaten cold from the fridge or slightly warmed from 1 minute in the microwave. 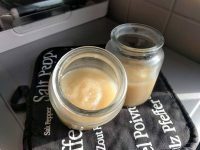 How to make Apple, Plum and Pears purée? 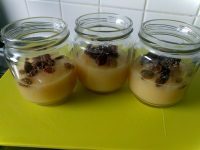 I usually stored the compote in glass yogurt pot in a fridge of a couple of days. I put some boiling water on each pot for sterilized them and then add the really hot compote inside. If you are using the Moulinex Companion, put all the sliced fruits with a dash of lemon juice and half of the water in the bowl with the knife, speed 3, 90° for 20 minutes. Then use the “pulse” for 1 minute and check the consistency of the compote.